Chefs the world over agree: Blindfire peppers are delicious! We may have gone a teensy bit overboard with plants, but Flora is so often overshadowed by Fauna that we decided to change things up some. We've got about ~50 types of plants mapped out as being unique to the Swordfish Islands. Some are relatively mundane, some are quite useful, and some would like nothing more than to digest you. Blindfire Vine (pictured above) is still being written up. Safari, being Safari, made it cooler than originally written, so the previously written paragraph was thrown out causing the battle between the artist and the writers to continue to escalate! Safari 1, Pandesmos 0. 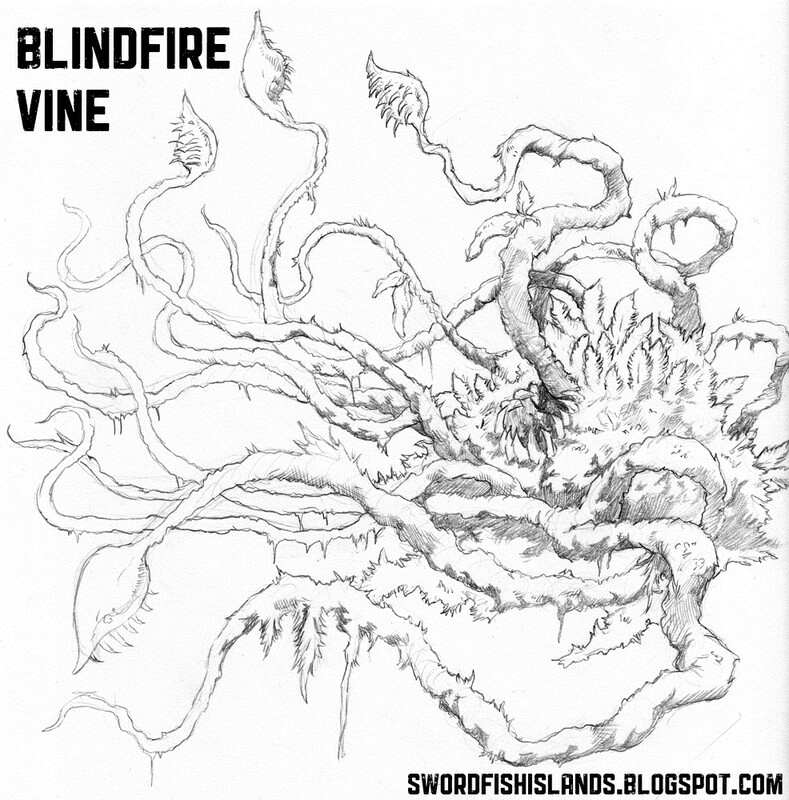 The quick version is: Blindfire Vine likes to eat adventurers and turn their nutrients into spicy peppers. The more adventurers a Blindfire Vine eats, the more delicious the peppers become, and the more desirable they are for adventurers to harvest. A vicious cycle ensues spurred on even more by Chef McBride's seasonal Swordfish Islands Wild Game Chili Cook-Off. There is only one other pepper savory enough to compete with Blindfire Vine chili, and that's the Cachuga Pepper. Pronounced Ka-hoo-gah, and sometimes called "Magma Bites" or "Lava Bursters", Cachuga Peppers can only be found on Hot Springs Island. Vaguely pyramidal shaped woody bushes with profuse foliage bear clusters of small, fragrant yellow blooms which eventually give way to fiery peppers of a marbled red-orange. The bushes bloom continually in the tropical climes of the Swordfish Islands causing Cachuga bushes to produce peppers in profusion. The peppers themselves are 2-4 inches long and hang from the bushes by thick, green, vein-like structures. Cachuga Peppers are exceptionally spicy and flavorful, rivaling the heat and potency of even the Blindfire Vine. The skin of these peppers is leathery and can be mashed into a paste then shaped and dried into chips or a flavorful yet non-spicy paper-like wrapping, pairing nicely with raw fish. The peppers dry well, retaining their fire and flavor for exceptional periods of time, and its seeds are often ground into a fine powder that causes *severe* eye and skin irritation. One of the most curious plants on the Swordfish Islands, the Spiderbush is a small shrub, rarely growing larger than 2' in diameter, with waxy, light green leaves and an exposed woody root system. Tiny blue and white flowers develop on the tips of its branches, blooming year-round. If a Spiderbush does not receive sunlight for a 24 hour period it will use its root system to waddle, or shuffle, across the ground in search of light. Having stubby, makeshift legs and frequently uneven jungle ground, Spiderbushes tend to lose their balance and tumble through the jungle. Due to their ambulatory nature and need for direct sunlight, Spiderbushes naturally cluster together in clearings or along the treeline near the shore of an island. Periods of extended rainfall have been known to trigger sizable migrations of hundreds, even thousands of Spiderbushes shuffling and tumbling through the jungle in search of the sun. Redgold's Feathers grow as small, tight clusters of burnished coppery colored feather shaped fronds near areas of thermal activity. The plant is impervious to head, and some claim to have even seen it undergo instantaneous growth when exposed to direct flame. If the leaves of this plant are broken or crushed they give off an acerbic odor potent enough to wake a person from unconciousness (even magical) or immediately recover from being dazed or disoriented. If the feathers are crushed and combined with sulphur and the essence of a naturally fiery creature, an alchemist can create a non-toxic mixture that will glow a bright orange for 36-48 hours (even after being consumed and digested). Wax Trees have large, fuzzy, almost white leaves that grow in bunches at the ends of twisted, dark brown, woody branches that are 1-3 inches thick. While most commonly growing to a height of 2-3 feet, some Wax Trees have been known to grow as large as 8 feet tall. A shallow and spreading root system robs nearby plants of food and moisture causing these trees to be found with few neighbors, even in areas of otherwise dense vegetation. The branches, if broken, ooze a translucent purple, viscous fluid that smells vaguely of citrus. The wax burns cleanly and evenly making it a good alternative to beeswax, and alchemists often seek it out as a foundation for magical glues and thickeners. Exceptionally skilled alchemists are able to use this wax to create a putty that can *permanently* change the shape and structure of facial features. The would-be master of disguise should be cautious however as minor, even accidental, tweaks to this formula will create a putty that causes organic matter (like faces) to dissolve and melt away in a matter of seconds. Standing between 6 and 8 feet high, with glossy leaves and twisting and contorted branches the Ashvein Tree (or Assassin's Cloak) is most notable for its thin papery bark. New growth on an Ashvein begins as a light blue-grey that slowly darkens into a rich charcoal, giving the trees a distinctive pattern. After the bark reaches a certain age it begins to crack and peel away from the trunk. If the dark grey bark is boiled in water for three hours, then dried and crushed, it creates a powder that completely neutralizes the flavor and odor of anything blended with the bark as it is crushed. Wood from the Ashvein is exceptionally light weight and releases large amounts of acrid smoke when burned. 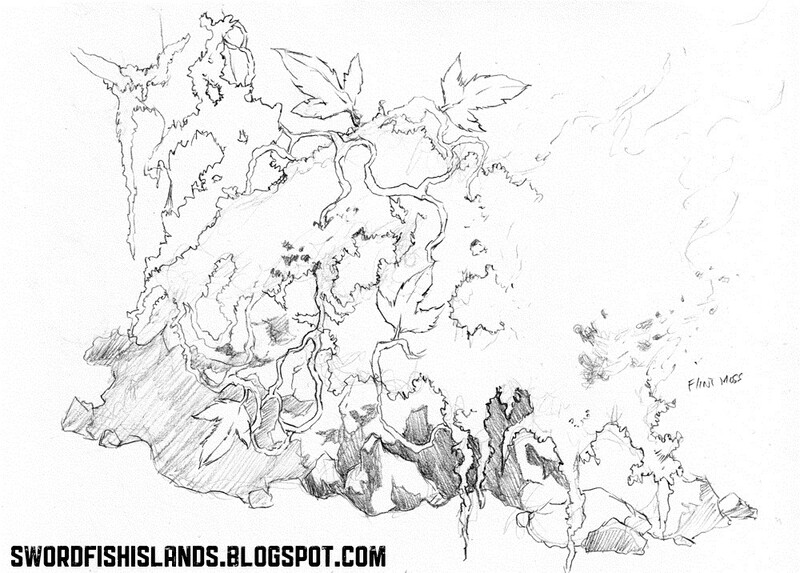 Writeup still in the works, but the art is grand, so check it out. Basically this ash-colored moss reproduces by being burned, so it is exceptionally flammable. 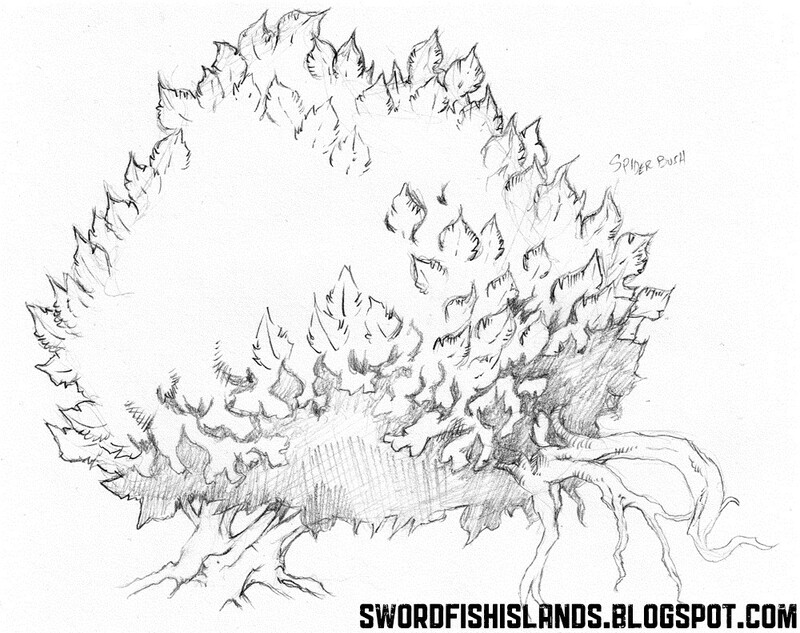 It tends to grow on rubble and scree so that sparks caused by falling stones (or clumsy footed adventurers) will set it ablaze and propagating.